Also known as Alternating Dumbbell Curl. Make sure the palms of the hands are facing each other. This will be your starting position. While holding the upper arm stationary, curl the weights while contracting the biceps as you breathe out. Only the forearms should move. Your wrist should rotate so that you have a supinated (palms up) grip. 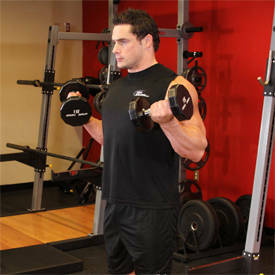 Continue the movement until your biceps are fully contracted and the dumbbells are at shoulder level. 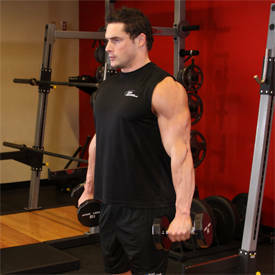 Hold the contracted position for a second as you squeeze the biceps. Now during the contracted position, rotate your wrist until you now have a pronated (palms facing down) grip with the thumb at a higher position than the pinky. 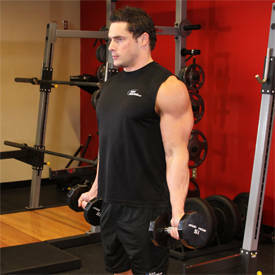 Slowly begin to bring the dumbbells back down using the pronated grip. As the dumbbells close your thighs, start rotating the wrist so that you go back to a neutral (palms facing your body) grip.